As a professional counselor and military veteran, one of the most rewarding aspects of the work that I do is helping other veterans come to a point of awareness and understanding about their experiences in the military, and setting the stage for change if that’s what the veteran is willing to do. Working with any client can be challenging, but veterans can be especially difficult because of the warrior culture that they are used to. Here are eight different points that I believe veterans would like their mental health counselor to know before working with them. There’s something about sitting down and talking to a stranger that a veteran finds challenging. Whether it is the fact that the veteran is going to share their darkest, most intimate secrets with you, or the fact that they have tried to do the same with others before and have been betrayed or hurt, it’s going to be difficult for a veteran to even reach out for help. I’ve heard it so many times that it’s almost become standard language: “I’m not even sure why I’m here. I mean, I should be able to handle these things, right?” The military mindset of enduring hardship without complaint remains, even though the veteran is no longer in the service. It’s important to help the veteran to understand the necessity of processing the events they experienced. Trust is a huge thing for veterans, as it is for many clients. From the moment that a service member joins the military, though, trust is a factor that is as critical as food and water for their emotional and sometimes physical survival. They trust their fellow service members to support them, to have their back, just as their brothers and sisters expect support. They trust in their leaders, their equipment, their training. Sometimes, that trust is betrayed, often in ways that the veteran doesn’t really understand, and that creates conflicts with what they believe to be right and what they experience in the world. For a veteran to sit down with a mental health counselor is the ultimate trust fall, placing not just their own life in your hands but often some of the most precious and meaningful things they can think of…the memories of those they’ve trusted in the past. In my experience, I’ve rarely known veterans to seek mental health treatment proactively. Instead, it’s usually a matter of, “I realized I need to get help” or “I’m here because someone told me I needed to get help.” There is an internal struggle between not wanting to admit to needing help and recognizing that it’s necessary and important. As long as the need is not apparent, then the action will not be taken. Unfortunately, there is usually some challenge in their lives that has become more significant than the barriers to treatment that exist, both in their own mind and in their environment. The fact that the veteran has been able to overcome the challenges they face in asking for help is a huge indicator that they really need to be there. If there’s one thing a veteran likes to do, it’s tell stories, and they have a whole lot of them. Stories about what happened to them, stories they tell themselves about what has happened to them, stories all over the place. Many of them are funny as hell, a large portion of them are unbelievable, and many are some of the most difficult things to listen to that you’ll ever experience. The veteran has a desire to be able to talk about their experiences and understand them. Simultaneously, however, the veteran has zero intention of telling the story they so desperately want people to hear. It might be because they feel like it’s an exercise in futility, that no one who has not been in the military or been to combat can possibly understand what they experienced. It might be that they are afraid that if they dig up the past, they will be haunted by the memories even more than they already are. For whatever the reason, the veteran both wants people to understand, without having to tell them about it. Waiting patiently for one of those conditions to change is critical. …and will shut down if I feel like you’re judging me. A particular way to destroy any type of rapport with a veteran is to express horror, condemnation, or revulsion at their experiences. 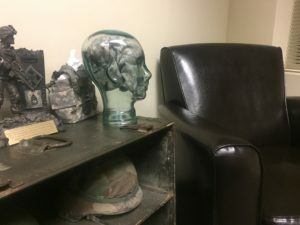 I recognize that a nonjudgmental point of view and unconditional positive regard are some of the most fundamental aspects of our counseling practice, but actually putting these into practice can be difficult when working with veterans. Seeing horror or judgment on someone else’s face can be like the veteran is looking in the mirror; it validates what they feel about themselves. I have no desire to be coddled, revered, or bullied. Three things that I have seen that a veteran finds challenging: being treated like a victim, being treated like a hero, or being treated like a child. They will reject the first, deny the second, and resist the third. I once heard another professional say, “I think that I could really work with veterans, because I’m very nurturing…I love rescuing broken-winged birds.” Approaching the veteran from this point of view, that they are a damaged and fragile human that just needs to be cared for, is a sure way to get them to reject any assistance you may want to provide. It may be true that they’re fragile and damaged, but they’re not used to being treated that way. Similarly, treating the veteran like a hero is something they don’t want. To many veterans, the most heroic people they know are the brothers and sisters that didn’t make it back from combat, and comparing themselves to those true heroes is a challenge. Again, maybe it’s true, maybe they had done some significantly heroic things, but they don’t see it that way. And finally, being forceful with a veteran…”you should just get over it” or “I’ll tell you what you need to do” is something that will increase resistance rather than reduce it. So there you have it…eight things a veteran wants their therapist to understand. This is by no means an exhaustive list…are there more that can be added? Are there some here that are off the mark? I’d love to hear your thoughts and comments. There can never be enough conversations about veteran mental health, and joining in that conversation can only benefit both veterans and those looking to serve them. Very well put. And although I have not (yet) worked as many armed forces veterans or LEO’s I have had the honor of their trust, and have worked with a large range of people who are slow to trust – for many reasons. I have found anyone appreciates being just LISTENED to, RESPECTED for “whatever”, and responded to with honesty. Mary, thanks for taking the time to comment. You’re absolutely correct…trust is key in the therapeutic relationship. Excellent points in the practice of counseling veterans. Thank you. I find all this to be so true.i have loved working with the Vet Choice program and it has stretched my clinical skills. This nailed it!